Throughout the year, there are lots of exciting opportunities to explore and discover the Country Park for free. See below for some ideas. The Reflection Points Trail has six points that will expand your appreciation of the Country Park. 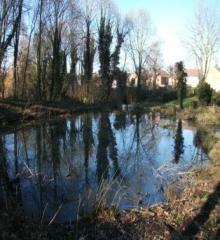 These have been chosen for a variety of reasons, some being places of beauty such as Wigston Nook and the Amphitheatre. Some are wildlife hotspots attracting certain birds or creatures of which Winter Wood is a classic example. A spectacular area of historic value is the Ridge and Furrow Field, whilst Lucas Ponds is a relaxing haven to enjoy the soothing sounds of nature. The idea behind the trail is that you can use these spots to reflect, appreciate and inspire. After taking in the views, the sounds and all that nature has to offer you may wish to use your experiences as a basis for your creativity, be it sketching, writing, painting or photography. This Den Building Pack is really handy when heading out to the Den Building Area. 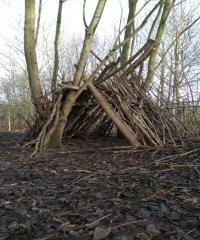 It gives a step by step guide on how to construct dens, as well as mini fantasy den ideas to try out in the Country Park. The instructions include diagrams helping the children to den build with more independence which is great for children of all ages playing together. As it is an outdoor activity involving sticks, branches and logs which can be heavy or a trip hazard please bear safety in mind as you enjoy yourselves. It is recommended that you download the leaflet as it has Health and Safety information alongside the den building instructions. Have Fun! Don’t forget to share the pictures you take whilst strolling through Brocks Hill Country Park on Facebook. We have digital photo frames on show in our entrance porch and some of our visitors’ photos have ended up on these for everyone to see! 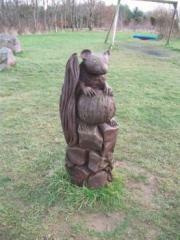 There are a number of sculptures throughout the Country Park, each one celebrating a different aspect of nature. At the front of the Centre you will find three sculptures, a butterfly, a heron and the owl and badger bench, each with their own story to tell. As you enter the orchard through the kissing gates you will find a trio of mini sculptures, of an owl, fruit and a pine cone. You can interact with the sun dial at the rear of the Centre telling the time with your shadow, or have a quiet moment in the memorial mound sitting contemplating the memorial tree. Moving further into the Country Park the Sun God is situated near Rotary Wood, and the mouse, walnut and beetle sculpture can be found in the play area. 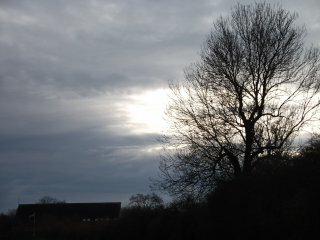 This walk will focus on the different varieties of tree which grow in the Country Park. Following a short but thorough trail you can experience many of the wonderful tree species that make up this natural environment. The trail is 1.2 km long and will take 15 to 25 minutes to complete depending of course on how many times you stop to admire the view!